This Labor Day weekend Bedford Speedway returns to racing action with a busy two race doubleheader. Friday night, August 31st, is the annual running of the Labor Day 55 for the Late Models. The Late Models will be joined that night by the Modifieds, Pure Stocks and Four Cylinders. Racing returns on Sunday September 2nd, with a full program for the Mason Dixon Series Late Model Sportsman racing for $1000 to win, Semi Lates, Racesaver Sprints, Four Cylinders & Penn Mar Vintage Cars. This weekend Bedford Speedway will be in action twice with racing on both Friday and Sunday evenings. As one of the wettest summers on record in Pennsylvania continues, the speedway has added a special Sunday show in an attempt to get our drivers and fans another race to help offset the rainouts. The Bedford County Fair Association will be presenting the 145th annual Bedford Fair Sweepstakes beginning on Friday night July 27th. In racing action Friday for the Frank Dunkle Tribute will be the Late Models, Late Model Sportsman, Semi Lates, Modifeds & Pure Stocks. It will be complete regular Bedford points races (warmups, heats, features), for all divisions. Spectator gates to the fair open at 11am on Friday with Pit Gates opening at 4pm. General admission is $10, and pit admission is $26. Due to the high attendance and space limitations of the fair race, we advise racers to arrive early and expect delays entering the fairgrounds. For questions about the fair please contact the fair office at 814- 623-9011. This Friday night, July 13th the Bedford Speedway will be celebrating 82 years of racing at the Fairgrounds oval. An exciting night of racing is planned with the Super Late Models racing 50 laps joined by the Modifieds and Pure Stocks. The winner’s share of Friday night’s Classic purse is $8200, with $600 to take the green, as part of a $35,000 total purse. Friday’s racing program is dedicated to the memory of Billy Winn, one of the top dirt racers of the 1930’s and the winner of the first auto race at the Bedford on September 5th 1936. 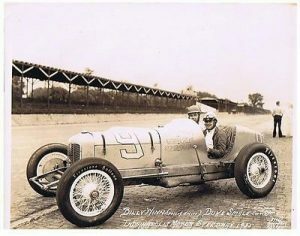 Winn, a 2003 inductee of the National Sprint Car Hall of Fame in Knoxville was one of the most outstanding racers of the depression era AAA circuit. Not limiting himself to dirt, Winn also competed eight times at the Indianapolis 500. Hosting its first race in 1936, Bedford is the oldest currently operating track in Pennsylvania, and one of the oldest in the country. The Late Models will lineup using the group time trial format, with heats lined up based on each timed group. The top heat finishers will then redraw for their feature starting position. As this is a Bedford point race, the 25th and final starting spot in the field will be reserved for the high Bedford point driver who fails to qualify in the heats of B-Main. As is Bedford policy there are no driver entry fees for the show. Drivers take note that regular Bedford rules and regulations will be in effect for this week. The Bedford County Fair Association will be presenting the 145th annual Bedford Fair Sweepstakes beginning on Sunday July 22nd, with the traditional Friday night show on July 27th. Both Friday and Sunday shows will be complete regular Bedford points races (warmups, heats, features) for all divisions. As is tradition, Bedford Speedway will celebrate the July 4th holiday with two big nights of racing action this week. 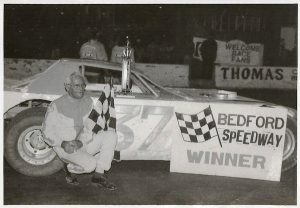 On Friday Night, July 6th we will be celebrating the legacy of the legendary Milt Miller with 100 laps of feature race action split between the Late Models, Modifieds, Semi Lates and Four Cylinders. The Late Models will be racing in a 30 lap, $3000 to win feature which will also be the final race of the three leg tri track challenge series between Bedford, Port Royal and Williams Grove. The Modifieds and Semi Lates will each have 25 lap features and the Four Cylinders 20 laps for a total of 100 feature laps. Friday Night, June 29th the Bedford Speedway will return to racing action with $2.00 admission for fans. In action that night will be the Modifieds, Semi Lates, Pure Stocks & Four Cylinders, each racing in a 20 lap feature event. Before the evenings racing action begins, all drivers are welcome to bring their cars up to the midway for a meet and great with the fans. Drivers are encouraged to bring autograph cards and pictures, their racing shirts to sell, along with their racecar up to the Bedford midway. Fans are encouraged to come early and spend some time meeting the drivers and getting up close to the racecars. The drivers meet and greet will begin at 5:30 on the midway, lasting until 6:30. At which time all drivers will be asked to return to the pit area to prepare for the nights racing action. Gates Open at 5:00, Warmups being at 7:00 with racing beginning at 7:30. General Admission is $2, kids 12 and under a free, with all pit admission being $25. 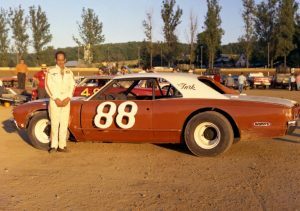 This Friday night, May 25th, the Bedford Speedway will honor the memories of two of this area’s greatest drivers, Johnny Grum & Turk Burket. The special event will feature the Late Models, Modifieds & Pure Stocks each racing in a 35 lap feature event. The Late Model 35 lap feature will pay $3000 to the winner while the Modified feature pays the winner $1000 and the Pure Stock winner will take home $400. With heavy storms moving into the area, Bedford races for Friday May 18th have been cancelled. We will be racing instead this Sunday May 20th. Tonight’s entire program will be moved to this Sunday night, with starting time an hour earlier. Sunday gates will open at 4pm with warmups at 6pm and racing at 6:30. In action will be the Late Models, Late Model Sportsman, Modifieds, Semi Lates and Pure Stocks. For 2018 a new pit area has been constructed outside turn four for use by Late Models & Late Model Sportsman drivers. Due to their increasingly tall trailers blocking the view of the fans, they will be moved outside the track. All other divisions will continue to be parked in the infield. This will allow for better sightlines of the track by fans, as well as making the infield less congested and safer for racers. Pit Parking: This season the parking in the pit area will be reorganized, to allow for better sightlines of the track for the fans. The current layout of parking has grown outdated as the racers rigs have continued to get bigger and taller, blocking parts of the track for the fans.